We’re back for another year of mentorships. This year we’re offering more than ever before with mentorships in three new disciplines. We’ve also moved. click here to see our new line up and find out how to apply. Applications for all of our 2012 Mentorship Programs are now available. Download them here and tell all of your friends to do the same. If you have any questions about applying, please call The Cultch’s Youth Program Manager at 604-251-1766. We are thrilled to announce our roster of mentors for the 2012 edition of the Cultch’s IGNITE! Mentorship Program. We are so excited to welcome back many of the talented artists we’ve worked with in the past. This high rate of return is a testament to just how much fun people have with this program. We are equally excited by our new recruits. They include Kathryn Calder of the New Pornographers, Victoria-based singer-songwriter Aiden Knight, acclaimed stage director Stephen Drover, and local dance instigator Amber Funk Barton. The application forms will be updated next week, at which point you and all your friends should start putting your applications together. We certainly look forward to receiving them. 2012 Mentorship Program Announcement Coming Soon! We are thrilled to announce that the IGNITE! Mentorship Program will be back for another year. We are busy confirming the 2012 faculty. Check back in mid-November for full details and to learn how to apply! Applications will be due mid-January, 2012. Program will begin in February, 2012. 2011 Mentorship Program details are here! We’re back for another amazing year! The Cultch’s Youth Program is proud to present the fourth season of our IGNITE! Mentorship Program. IGNITE! is designed to offer youth in Vancouver unprecedented access to professional artists and to demystify what it takes to build a career in the arts. In 2011 we will be offering mentorship programs in Songwriting, Spoken Word, Dance, Directing, and Playwriting. The program is free for young artists between the ages of 13-24 who want to pursue a career in the arts. Each participant is paired with a professional for a series of participant-driven one-on-one workshops. In addition, the youth receive skill building workshops with industry professionals in areas such as grant writing and media relations, an opportunity to document their work in a professional studio environment, and a showcase performance on the Cultch’s stage. Full program and application details are available right here, right now. We are thrilled to announce that the IGNITE! 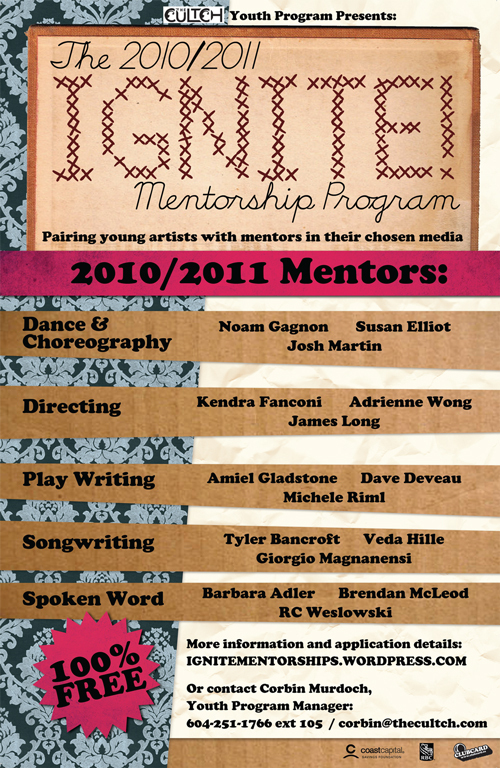 Mentorship Program will be back for another year during The Cultch’s 2010/2011 season. Once again we will be offering one-on-one mentorship opportunities in Play Writing, Directing, Spoken Word, Song Writing/Composition, and Dance/Choreography. Stay tuned for program details and the announcement of our 2010/2011 mentors. For further information, please contact Youth Program Managar Corbin Murdoch at 604-251-1766 or corbin@thecultch.com. To participate in the 2010/2011 Playwriting Mentorship Program beginning next fall, you must submit a one-act play to the 2010 Young Playwrights Competition. The three winners of that competition will become the participants in next year’s Play Writing Mentorship and will have their work premiered at the 2011 IGNITE! Youth Festival. Please click here and scroll down to Playwriting to learn how to make an application to the Young Playwrights Competition. The application deadline is May 1st, 2010. The 2009/2010 Play Writing Mentorship program is currently underway. We are currently accepting submissions for the 2010/2011 Mentorship. The three winners of the 2009 Young Playwrights Competition, Christine Quintana, Jennifer Bednard, and Deborah Vogt, have been paired with three of Canada’s premiere playwrights: Shawn Macdonald, Michele Riml, and Amiel Gladstone. Working closely with their mentor, the three participants will be editing and redrafting their winning submissions, preparing the scripts to handed off to the participants in the 2010 Directing Mentorship, who will produce the plays as part of the 2010 IGNITE! Youth Arts festival. The three shows will run Monday, May 17th to Saturday, May 22nd in The VanCity Culture Lab at The Cultch. This process will repeat itself next year.